Makes a great centerpiece for a party - same as our Yorkshire pork pie (1 lb. sized classic) but decorated with leaves. With a pretty leafy decoration, this large, traditional pork pie makes a fantastic centerpiece for your party. 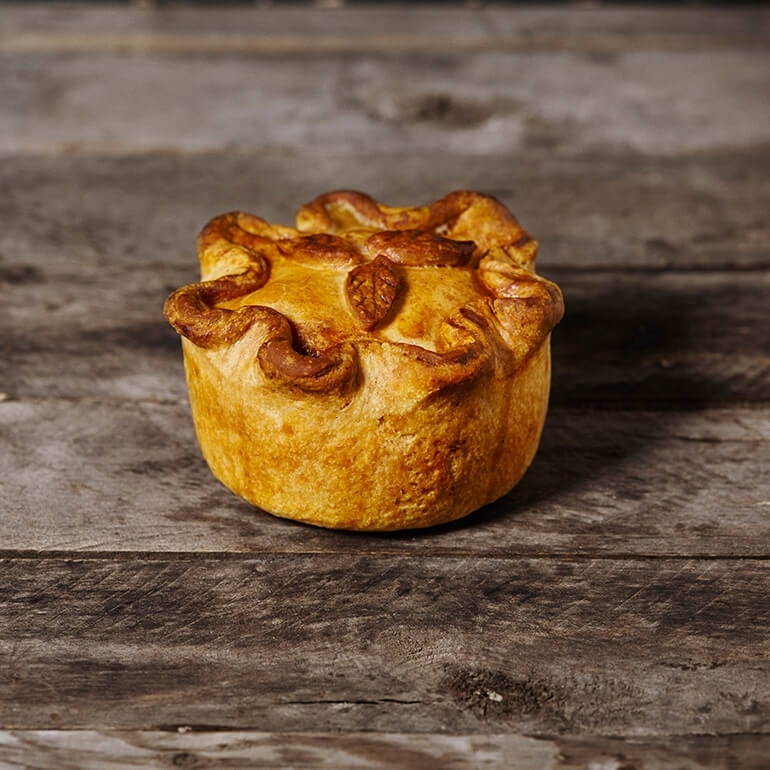 It’s crafted using choice cuts of seasoned pork, juicy pork gelatin and our homemade hot-water crust pastry. The pastry is made to a secret recipe by an old Yorkshire butcher and handed down through our family. Enjoy with a pint of British ale – or two! Don’t forget that pork pies are best eaten cold or at room temperature, but you can warm through if you prefer. Pork, Wheat Flour, Water, Lard, Gelatin, Rusk (Wheat flour, Water, Salt, Ammonium Carbonate (rising agent)), Seasoning (wheat flour, salt, Spices, Dextrose, Sodium Triphosphate (Stabilizer), Yeast Extract, Sugar, Sodium Nitrite), Salt, Glaze(Water, Maltodextrin, Modified Starch (Maize), Dextrose(Wheat) Methylcellulose, Caramel Color, Annatto Extract (color)). I bought the one pounder...good thing I did..it disappeared fast! So delicious...the meat/seasoning was perfect as was the pastry (the second most important ingredient) and to top it off..the gelatin! You guys have a winner here...thank you! As always these pies are delicious and with Branston Pickle definitely remind me of home. Everything from the English Pork Pie Co. makes ones mouth water. Quality exceeds what you can get at home. WOW! What a wonderful surprise on my entire order, everything was just like being back home at the Pork Butchers Shop. The sausage rolls wonderful, the pork pies wonderful, the Cornish pasties wonderful, the Cumberland sausage wonderful. We haven't yet eaten the scotch eggs, meat and potatoe pies but they look as wonderful as the rest of my order. I was in 'PIG HEAVEN'and told several of my English friends to order from you. I will be a frequent shopper with you. In fact this is a great idea for Christmas Presents. Do you deliver to San Diego, California? I must check your deliver list. THANK YOU SO MUCH. You have no idea how much I had been longing for a pork pie. DELICOUS!!! as was everything so far. The pork pie was delicious. You will not go wrong buying one of these. Beats M&S pies hands down. Just like the pork pies and sausage rolls we get in London, yum! Flaky crusts, delicious filling, with brown gravy and boiled potatoes it was a scrumptious dinner. I wish they came in small, 3-bite sizes like they sell at M&S! Great, fast service. I will definitely be ordering from you again. God, I love these pies...Sadly, so does my american wife!!!!! Fabulous and tasty...couldn't be happier with my entire order!! Excellent pork pie... exactly how they should be. I bought this for my husband as a present since he hasn't been able to travel back to England for the last few years. His words: "Excellent pork pie... exactly how they should be." I'm not English, but the kids and I also enjoyed them... the kids especially liked the crust. Thank you! I am a expat of some 30+ years and from time to time like to sample the old foods. I have sampled food from a lot of ‘English food stores’ and I have to say the items I bought here Bacon - best I had in a long time. Sausages got good flavor. Pork pies great taste and plenty of meat. Pastes loaded. Good old steak and kidney - loaded with meat. 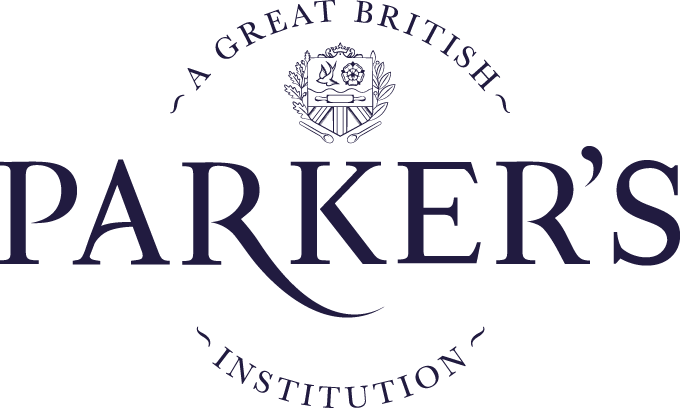 If you have never had any thing from this site you are missing out on some excellent English food. Traditional Pork Pie came packed to the brim with absolute deliciousness. The English Pork Pie Company’s Traditional Pork Pies are delicious! Our whole family loves them. We have been in the US since 1987 and really missed proper British pork pies, but now we have a little taste of home, made right here. Perfect! Very good pies i will get them again! Great taste, just like I remember them in England. Very fresh. All you need is a little HP sauce. Great crust, great filling. Thought I was home in England! Honestly forgot how much I love pork pies, this was amazing, I will be ordering more!!!! Perfect -- I loved it! I received my pork pies safely and they were well packed, frozen and in perfect condition. As an English expat this is truly an exact taste from home. Thank you so much! The best steak and ale and pork pies! EPPC is magnificent in its production of Traditional British Pork Pies. The truth is I was brought up on Mr Ken Parr's 'Pork Farms Pies' with its Signature dark and crispy pastry!!! Sold throughout the 'Midlands' from 1930's -90's Untill the interference by the European Union laws & by 2007 even 'Pork Farms' had to stop production on its Traditional Pie & Change production to the EEC approved 'Melton Mobrey' I have one of EPPC's in my Freazer as we speak! Now if only EPPC could make Mr Parr's 'Pork Farms' Pasty that Pork Pie would be a world Clasic!!!! Excellent pork pie and every other pie I have had from them; it was especially good to have the steak and kidney pie, the first I have had since moving to the USA in 2000. I am generally very impressed by the products. This was the first time that I'd tried them. They certainly were filled "to the brim" with tasty pork, and the pastry so was so crispy and light. They were wonderful. Good ole fashioned pork pie made just like we were still in England! Arrived in perfect condition, still frozen. Cook really well from frozen. We really enjoyed. Thanks so much for a great product! The pork pies are wonderful. Loved them with HP Brown Sauce! Will continue to order. A real treat! Lovely pork pie! We recieved the large size free with our order. Had a cute little heart on top. My husband and I throughly enjoyed the pie. Lovely crust and filling. Just like it was straight from the butchers shop. Can't wait for dinner tonight, having Cornish Pasties, with chips and peas. I love ordering from you, your food is brilliant! Yummy. Both my husband and I are 80 percent English by descent. He ate Pork pies cold as a boy and young man. We didn't know we could get them here until we searched online. The quality was exceptional for the pork and crust. i order these pies as a valentine gift to my husband...he was thrilled- loves them! Can't live without EPPC and their pies!! First time trying the big pork pie. Not a crumb left behind. Only 1 item in our total order. Many pies and pasties await us in the freezer. Love EPPC ! Hooked on pies! We adore the pork pies, they are so good and take us right back to picnics in Derbyshire. Great pies And sausage rolls!!! I'm addicted to the pies. I had the farmhouse pie and it was great. I will be ordering more soon. everything we've purchased from English Pork Pie company has been fabulous! My English husband truly appreciates the taste of home. Your delectable pork pies (my Valentine's gift to my husband) has made me one very popular wife. He is over the moon about them. Well presented, packed full of meat. The best that I have had here in the USA since I moved here over 30 years ago. Will definitely be ordering again. I love them, You have got the taste down. This is an excellent pork pie, just like the way I remember growing up in Cheshire. English pork pies, bacon, sausages. I absolutely love this pie. Everything about it is bloomin' grand!!! our first order and there will be many more I am sure. The pork pies were beautiful. Really meaty and great pastry. The pies were just great as always!! Pies for Xmas dinner! It's a new tradition. My fella from the U.K. said " Pork pies, pork pies, I haven't had a pork pie since I was last home!" Thank you for bringing joy to our holiday! We enjoyed the Traditional and Yorkshire pork pies. Both were delicious. My opinion or review would be the Yorkshire might have had a flakier crust while the traditional had a very tender crust. I would not hesitate to order either again. We are already filling up our online shopping cart. Once again you fulfilled a present for Ex Pats in the USA. So thank you for making it possible to send a piece of England to my Sister & Brother in law! So enjoying our Holiday treats! The Sausage Rolls are devine, the Chicken Tikka amazing. Can't waitto dig into the pies and pudding at Christmas. Thanks D and V! 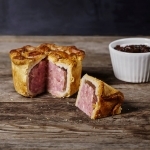 Service and product are excellent and make a great addition to special gatherings, share our purchases with English friends and they agree that the product from the English Pork Pie company is just like home. What a blast from the past, a real feeling of being back in the British Isles. The pork pies I bought, (Gala, Yorkshire & traditional), were delicious, just like I remembered pork pies tasted all them years ago, brilliant, 5 stars. Couldn't be happier than a pig in ****! Some tasty little piggies gave their all to be part of these pies. Don't disappoint them buy them and eat them up and make everyone happy. Excellent service and yummy food. Despite a scare when Buffalo was under 5 feet of snow, Vicky got our order to us bang on time, and it was all delicious. We had a huge pork pie, lots of Cornish pasties and various chutneys and sauces. Yum. So far we've tried the steak and mushroom, steak and kidney and the chicken pies. The flaky crust is MAGNIFICENT! The pie's interiors were very tasty, but could be a little more moist. We will buy again. Tastes like home from across the pond!! We thoroughly enjoyed it with cheddar cheese and pickled onions. We will be ordering more! These were amazing. Our american visitors, who couldn't get their heads around a cold meat pie, made us heat them up. Dear review reader, don't do it. They are perfect old or at room temp. Don't be tempted to heat them up! This just means that one pie is never enough - you want more. At last! After waiting over 30 years for the real thing. Excellent! The English Pork Pie Company has delevered to me what I have craved for; pies made in USA AND authentic! I dont have to smuggle them through Customs anymore. Price is high but worth it for special treat, Perhaps if we have enough people buying, the sales increase will bring the price (and handling) down, then we can order every month. Wouldn't that be great! Just like home and will buy again. Was soo' good to enjoy a 'real' taste of England again! Have tried some of the other brands elsewhere; but they are not as good as this one. Having recently returned from England I realised how much your Pork Pies are just as good as any to be had back in England. I do think that you also have a bit more jelly in yours which is something that we all look for. Without a doubt I will be back, as I have been for aq few years now. Sasuage rolls are good too! Have tried the pork pies and they are scrumptious, they arrived quickly, very happy. We thoroughly enjoyed the pie, but would loved to have more Aspic (Gelatine). A yummy taste of home. Everything was delicious don't usually buy the traditional pork pie, it is now my favourite. The sausages await our vacation wouldn't be a vacation without our bangers and mash. I didn't realise how much I missed English pork pies until I tried one of these. Now I just need to get some Branston and I'll be in heaven. We had looked everywhere for British pork pie and were happy to have found this company and its excellent product. It arrived chilled in a thermal container on a very hot summer day. Impressive! We will definitely buy from them again! Every year I help organize a English picnic in DC. For the last two or three years we have used English Pork Pie Company Cumberland Sausage to make homemade sausage rolls. They are among the most popular food at our events! Plan to order again soon! We were very impressed by your pork pies, especially the Yorkshire and Stilton Pies. We haven't tried the Cumberland and regular sausages yet but are looking forward to it. My husband and realy enjoy your pork pies, having recently returned from England, and enjoying Melton Mowbary pork pies, I fine yours , a good comparison. Thank you. This was great!! One bite takes you to that beautiful island of great food and old culture!! Love everything we have tried - pork pies, beef and onion pies, sausage rolls, bangers and bacon. Was able to give my English mother a taste of home and she loved it too! Over the past 30 years life for a homesick Brit has steadily improved in the USA: the Internet provides real-time news and sports rather than having to rely on 3 day old Sunday papers; Microbreweries produce fine ales and lagers to rival any in the world and imports are commonplace; grocery stores stock condiments and sweets from the UK; and the dismal sweet prepackaged breads are now supplemented by artisan bakeries which produce the full range of fresh fragrant loaves. Only one class of products remained elusive: the savory range of pies and pasties and sausage rolls that every supermarket and corner bakery in Britain supplies in abundance. But now there is the EPPC. A few simple clicks on a web site and the full range arrives at your door to stock the freezer with a range and quality to match (and even exceed) that available at home. True contentment. Finally. Your pies continue to exceed all expectations. A perfect traditional pie with delicious gelatin. Thank you. I know of no other US supplier that does what you do. We are ordering up a batch for our 50th wedding anniversary celebration. How miraculous that the one company that seems to be doing English pies out here is of such unimpeachable quality. Bravo, English Pork Pie Company LLC!!!!! What a pie! Everything was delectable. Genius. ... One of the best I've had in fact... and I've eaten a lot! What can I say, delicious, speedy. . .oh, and delicious - cheers! We recently received our third shipment of items and once again the quality is first class. Excellent is the best I can do, we all thought so. Wow, just like being at home. We bought three different Pork pies, Sausage Rolls, Lincoln Sausages and a Cheese and Onion Pie. The only one we didn't rate was the Cheese and Onion - sorry, nowhere near as good as mum's (actually grandmother's recipe), but the wow factor of everything else far outweighed that little set-back. Fantastic. we will definitely be buying again. Both were excellent products, and well worth the cost. Wonderful....It was a pie sent from Heaven!!! Loved the pork pie, saved my Christmas, along with Branston Pickle. I worked for PorkFarms as a student and would like to see more seasoning and a darker crust, but otherwise just what I wanted from Santa ! An always welcome treat, and very authentic tasting. I shared this year with my Argentine girlfriend's family and they loved it! Very tasty but not as spicy as expected. A bit milder than I recall. Absolutely amazing. The whole family loved it. All the products I ordered for Xmas (pork pies, sausages and steak and kidney pies were delicious). They arrived beautifully packed. Will certainly be ordering from you again. I order pork pies every year for the holidays, and every year they are perfect, and everyone enjoys them. Authentic and delicious! This year I'd actually been back to England for the first time in a few years, so the pies had a lot to live up to - and of course they did. Thanks again for being a part of our holiday tradition. An excellent pie. Not to be shared with anybody......!!! Absolutely delicious, Have not tried the traditional pie yet but expect it to be just as good. Will certainly order again. Genuine taste of home - well done! My husband's from Manchester & I'm from Oxford so we don't often agree about "truly authentic English food", but your products are great! Pies were as wonderful as ever. First time for the stuffing pork pie. I could smell my mothers kitchen. I never knew a pie could make you smile. This is our third delivery from EPPC. It just gets better and better.no need now to smuggle your pies through customs, these pies are as good as any you can get in Blighty! I bought the traditional pork pie and sausages, bacon & black pudding for my husband (an enthusiast ) for his birthday! As Brits far from home it was terrific to be able to enjoy these British classics and that they were great quality & tasted absolutely authentic. We are so pleased to have found this source of first class traditional english food. Items that most brits find they missed, such as pork pies, sausages, etc. Highly recommended. For those that appreciate a good English Pork Pie, look no further, this is your place. AND....the sausage rolls were FABULOUS!!!!! Haven't tried the bangers yet, but we suspect they will be just as good -- thank you!!! The pie was great and the shipping was fast!! Great pork pies! Fast shipping! We love all the products and had the steak & kidney pies for dinner last night. All the pastry on the pies is so tender and the flavors and quality of the meat and veggies wash down well with ale. Looking forward to more treats and will serving lots for entertaining. As close to English as you can get,I will be ordering more. Excellent Service , Excellent Pies! Wonderful - took me right back to home! Now I'm homesick - better make a reservation! We have continued to order from EPPCO just because of the delicious entree's like the traditional Pork Pie (Delicious!!!) AND your Sausage rolls. We live in California, and the goods come so well p;acked that we have no concern about freshness! I have lived in Western Canada since 1977 and have NEVER have been able to find an available authentic pork pie until now. Your pork pies were absolutely delicious and the best i have ever tasted. They are even better than the pork pies from Harrods that i used to buy upon my infrequent trips back to the UK. The pork meat filling is really nicely spiced, the gelatine is very flavorful, and the pastry is great. I also tried the Cornish Pasties yesterday and they were superb, and filled with very tasty ingredients. Your products are terrific and I'm so glad that you can now ship to Canada. I'm passing the word on to all my English friends. I'll be ordering again soon. Pastry was really great and the meat good. Best I have had outside of the UK, and better than many I had there.The process of defrosting in the oven caused the jelly to melt and run out, otherwise would have been perfect. I found the company somehow a year or two ago and never placed an order, then finally I decided to try ALL of the pies (I literally ordered one of ever type.) They arrived quickly and more importantly very carefully packaged and cooled. Each day I tried two pies (yes, I did a lot of extra running during this period) in order to discern which would be my favorites for re-order; unfortunately for me, I discovered that I liked ALL of the pies. LOL. Now I'm on to the sausages and bacon. Can't wait to try to the Pork & Tomato. Your pies are wonderful, and we appreciate being to buy traditional British foods on this side of the pond. Consider me a regular customer.